MICK MCCARTHY and Seamus Coleman have paid tribute to Jon Walters after he announced his decision to retire from football due to injury problems. The news broke before Ireland's pre-match press conference in Gibraltar ahead of tomorrow's opening Euro 2020 qualifier. Walters had come into the camp on Wednesday to tell senior players the news and McCarthy said he had spoken with the veteran striker about his enforced call. "It's sad to see him go but it happens to all of us, to the best of players," said McCarthy. "He was an inspirational player for Ireland. It's sad when you lose those players. It's sad that it is because of injury. I know he will be supporting us and wishing him well." Coleman said: "As long as he's been in the squad, he's been an example. The pride every time he has played for his country, it's been inspirational. He nearly carried us to the Euros in France." 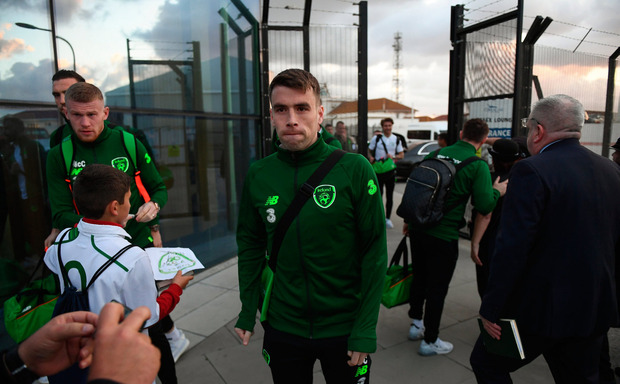 McCarthy has confirmed that Coleman will captain the side here tomorrow and said he will let the players know the team later this evening - a contrast from his predecessor Martin O'Neill who used to leave it late. The quality of the artificial pitch and the impact of the wind has been a pre-match talking point, yet the visiting manager attempted to play it down. "You are aware of where we play our football," said McCarthy. "We don't play in ideal conditions all the time in terms of weather. I've started in Barnsley and I've been to Sunderland and Glasgow. "Apparently they will water it until an hour before kickoff. I have to say they've been very gracious in their hospitality. They've looked after us really well."